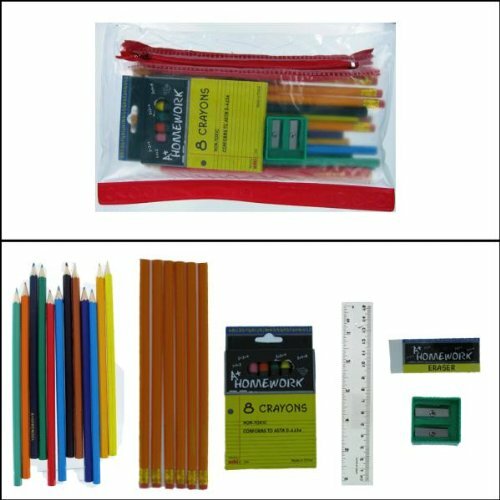 Twelve standard colored pencils: variety of colors; 6.72 inches long; Variety of colors and shades in this wholesale bulk discount cheap kit. Six #2 Pencils; Approx. 7.5 inches long; 5/16 of an inch thick; Eraser is 1/4 an inch long. Box of 8 standard crayons, Each crayon is 3.5 in. long, .25 in. wide; Red, Orange, Green, Blue, Purple, Yellow, Pink, Black; non-toxic, non-washable. Eraser; White; 2.25 inches long X 7/8 inches wide X approx. .5 inch thick, wrapped in plastic. Crayola - Classpack Crayons W/Markers 8 Colors 128 Each Crayons/Markers 256/Box "Product Category: Writing & Correction Supplies/Crayons & China Markers"
Crayola - Classpack Regular Crayons 8 Colors 800/Bx "Product Category: Writing & Correction Supplies/Crayons & China Markers"